Overview – The Tranquility Premium Overnight Disposable Underwear is the perfect product for those looking for a dry, full night’s sleep. Tranquility’s signature features are found on this product. The peach mat construction core, dual cuffs at leg openings and maximum capacity are key features. They also have an ample, full-rise waist panel for a better, more proportioned fit. There are tear-away side seams for ease of change. The Tranquility Premium Overnight Pull-Ons are a best selling product with one of the highest capacities. Absorption – Tranquility brings advanced technology along with quality to their products. This helps in your selection of products to utilize. This product is tested under the C.U.P. testing. That is Capacity Under Pressure. The capacity of the product is tested under a pressurized flow not the soaking method. This is how the fluid is released from your body. The peach mat core is the inner core of the product. It absorbs fluids quickly and traps it away from the skin. By quickly absorbing the urine, it helps with the odor control. It locks in the urine so the bacteria cannot thrive. This all helps keep your skin healthy. Fit – This overnight underwear features the Tranquility dual cuff design. The Tranquility products feature an inner and outer cuff. Most common place for leakage is at the leg openings. These inner cuffs direct the liquid toward the center core. There are tear away sides to assist in the change process. This allows you to tear the sides open to do a product change. This pullup is available in a wide variety of sizes from x-small to 2X-large. Odor Reduction – The peach mat core is the ultimate in odor reduction. This core absorbs the fluid so quickly that it neutralizes any odor. It keeps the fluid contained in the core also eliminating any chance of odors. Additional Products – You can also add booster pads to add to the capacity of the product if needed. Some people also use a coverup for added personal security. Suggestions Alternatives - Style and Also Bowel – The Tranquility Premium Overnight Pull on is not rated for bowel incontinence. As it is a pull on, a good substitute might be the Tena Discreet Protective Underwear. There are only a few pull ons available for bowel incontinence. If you have decided you prefer the brief with tabs style, a good alternative would be the Tranquility ATN Disposable brief. The briefs are the same high quality with almost the same capacity. 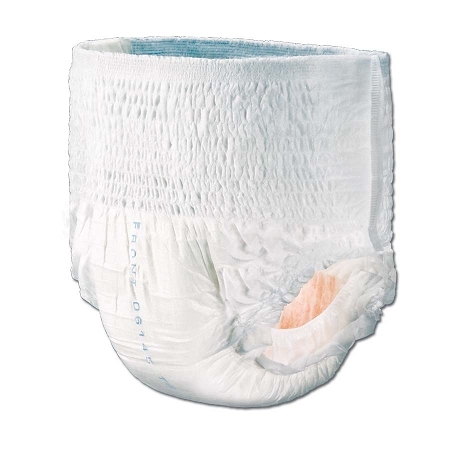 Note that the Tranquility Premium Pull-ons are more expensive, but also have a lot more absorbency and features. A lot. My bedding and myself are soaked every morning. Does this product help with that? If you are experiencing leakage at night, it is very common. There are generally only two reasons why you are experiencing leakage – not a high enough capacity product or improper fit. Normally it is the product capacity. The Premium Overnights are one of the highest capacity products available. I am using pullups during the day but they are not enough for night time use. Does this pull up have a higher absorbancy than most? The Tranquility pullups have one of the highest capacities available on todays market. Depending on the size you need, they will hold any where from 20 fluid ounces to 34 fluid ounces. That is between 2 to 4 cups of fluid. I am currently using a pad during the day but they don’t seem to be enough for overnight use. Will this product help? The Tranquility Premium Overnight underwear is a pullup design. This design makes it an easy transition from your normal underwear into a fully enclosed incontinence product. It is so much like normal underwear you won’t notice a difference except you will be dry in the mornings. I keep having problems with staining and odor due to leaks. Will this product help? If your product is leaking overnight, this product often does the trick. To protect your mattress use underpads for additional absorption capacity. Not sure how much capacity I need for overnight. Will I need anything additional if I use the Tranquility Premium Overnight Underwear? Some customers like the feeling of added protection. That can mean adding the use of a booster pad within the product and /or adding an underpad to the bedding. Some even add an adult cover-up. If I only order product in pack size, will I have to pay shipping? It's free shipping for the lower 48 states. Sometimes, a product to Hawaii or Alaska is subject to the actual shipping charge involved in the delivery of product. I am having a difficult time transitioning my parents into using incontinence products. Any suggestions? My people have a difficult time accepting the fact that they need incontinence products. Many of the newer products are much like normal underwear - the pullup styles for instance. They pull on and off just like normal underwear. The Tranquility brand has a very high capacity so it can be worn longer, thus less changes. About Tranquility– Tranquility is manufactured by Principle Business Enterprises. PBE has been in business since 1961. They are dedicated to providing quality, high capacity products with innovative design and high performance. This is a great company to order from. We keep what we need on automatic shipment and never worry about running out. These are much thicker than the ones in the stores. Give them a try. These are excellent - hold a huge amount. Only problem is my wife seems to be an in-between size. Large is too small and extralagre works but sometimes leaks. I have been ordering from this company for awhile now. I always receive my product quickly. This item is very helpful for my mother with Alzheimer's. She wears them day and night. They are easy for her to pull up. this is the best product I have every used...It is a joy to wake in the morning with blankets and sheets dry...a restful nights sleep...thank you for making my life a little easier! I am very happy with Tranquility Overnight Pull ons.I have tried others and they do not compare to the comfort .I have recomended them to my frieinds .The only problem is I can't purchase them in Canada for the price I paid in U.S.